Whombo combos, mumbo jumbos: that’s what veterinarians who understand immunology call combination shots. Unlike a vaccine such as rabies, which contains a single virus, combination vaccines contain multiple “modified live” viruses mixed with various bacteria. Think of them as toxic soups, biochemical wolves in sheep’s clothing. When your vet sends out reminders to bring your dog “up to date on shots,” expect the whombo combo. Beware the wolf. You’ve probably seen combo shots listed on your vet bill as DHLPP, DHLPPC, DA2LPPC, 5-Way, 6-Way, 7-Way, 7 in 1 or the like. After you learn more about them, you won’t want to see them on a bill again. Why would your vet use combination shots? Profit and convenience are the big selling points. Vets in large corporate practices, even those who don’t like combo shots, may be under orders to use them. I suspect some vets don’t realize (or want to believe) how dangerous these weapons of over-vaccination can be. Pharmaceutical reps, frequent visitors to veterinary clinics, promote the shot’s many benefits for the vets while minimizing potential risks for pets. Adverse reaction reporting is voluntary and rare. The 2007 World Small Animal Veterinary Association (WSAVA) Vaccine Guidelines reports (regarding all vaccines) there is: “gross under-reporting of vaccine-associated adverse events which impedes knowledge of the ongoing safety of these products.” Unless a vet is an avid veterinary journal reader, he/she may be stuck in the mindset of believing shots are safe and that if shots are good, more shots are better. Proponents say that the combo saves Spot multiple needle pricks, and saves you and your vet time and money. True — but only if vaccinating against multiple diseases is really necessary … and only if expensive adverse reactions don’t occur. Why should you avoid combination shots? Immunity given by some vaccine components can last for years, even a lifetime, but other components may give immunity for less a year, yet they’re packaged together. This is the pharmaceutical equivalent of packaging beef jerky and ice cream together. To keep immunity strong with short-duration vaccines, the long-duration vaccines have to be given again and again needlessly. This exposes your dog repeatedly, for no good reason, to adverse reactions which may include skin diseases, autoimmune disease, allergies and even death. Vets who still, for monetary reasons or ignorance, vaccinate annually find this practice quite convenient. Jab away. But vets who’ve switched to vaccinating every three years — which is still a misunderstanding of current guidelines recommending vaccinating “no more often” than every three years — aren’t using the short-duration vaccines often enough. Either they don’t believe the short-duration shots are really necessary (which is usually true) or they are being negligent and putting your dog at risk. Some combo components are made from viruses, some are from bacteria, all delivered at once with a dangerous punch. Small dogs and puppies suffer more adverse reactions when receiving multiple antigens at once. This means: no combo shots for small dogs — or any other dog for that matter. And NEVER EVER GIVE ANY OTHER SHOT — ESPECIALLY A RABIES SHOT — WITHIN 3 WEEKS OF A COMBO. This also means no Bordetella given nasally. Giving rabies and Bordetella with a combo could mean as many as 9 shots in one day. Some dogs don’t survive this. If your dog experiences a reaction to the combo shot, there is no way to determine which antigen caused the reaction and must be avoided in the future. Determining which antigen caused the reaction is like trying to determine which ingredient is causing an allergic reaction to kibble. It can’t be done. If all this isn’t bad enough, the components are unnecessary for most adult dogs, the great majority of which have lifetime immunity to the important shots or have no need for other ingredients. So, exactly what’s in these combination shots? The ingredients differ, but here are some in the most common combos. The D is for distemper and one P is for parvovirus. Your dog very likely has lifetime immunity to both if he has had even one shot for these diseases after 4 months of age. These are important shots, but they needn’t be given again and again. In fact, adult dogs rarely need revaccination for parvovirus and distemper and there is a simple blood test called a titer test that your vet can run to prove immunity. H stands for hepatitis, a disease virtually nonexistent in North America. Sometimes this is expressed as A2, or adenovirus 2, which gives cross protection to hepatitis. According to the 2006 American Animal Hospital Association Canine Vaccine Task Force Report, it gives immunity for 7 or more years. To protect against the disease reemerging, renowned pet vaccination expert Dr. Ron Schultz recommends giving adenovirus-2 just once after a dog is 16 weeks old. The other P is for parainfluenza (giving immunity for at least 3 years). It is also a non-core shot and does not protect against the canine flu. C is for coronavirus, a vaccine specifically “not recommended” by any major vet organization or school. Extremely rare, it’s called “a vaccine looking for a disease.” Diodati reports that the reactions from the shot are more dangerous than the disease itself. Combination shots are part of the unethical practice of over-vaccination of pets. They should have no place in your dog’s health care regimen. And vets who use them should have no place in your dog’s life. Did your vet inform you fully about this shot before giving it? If your dog was given a combo shot, and your vet didn’t explain exactly what was in it, why your dog needed it, why your dog may not have needed certain components, and what adverse reactions they may cause, change vets (and tell him/her why) and report that vet to your state veterinary board for using products not backed by science and not informing you properly. This is the only way things will change. Veterinarians have a legal obligation to obtain your informed consent before vaccinating by fully disclosing benefits and risks of the suggested shot — and alternatives. Of course, had they told you the truth about these shots, you’d probably wouldn’t have consented. 1. Test titers for parvovirus and distemper. If titers are strong, don’t revaccinate. (If weak, read my article.) Forgo lepto, coronavirus, hepatitis and everything else unless your dog has an urgent, proven need because of the special circumstances of his lifestyle. 2. Avoid clinics that subscribe to “one size fits all” vaccination even though all vet schools and organizations recommend otherwise. 3. If you’re vaccinating a puppy, or a young dog with low antibody titers, ask your vet to use a monovalent vaccine (meaning the vial contains only one vaccine). Also, use vials with only one dose to avoid the extra chemicals preventing contamination in multi-dose vials. Three readily available vaccines include: Galaxy Pv (a shot containing only parvovirus, offering 7+ years of immunity) and Galaxy D (a shot containing only distemper, giving 5 or more years of immunity). If those aren’t available, use Intervet Progard Puppy DPV containing both parvovirus and distemper but nothing else. 4. If your vet won’t purchase monovalent shots (protesting that his distributor doesn’t carry them), purchase them yourself and have your vet give them. Refrigerate until use. Better yet, have them sent to your vet by the reseller. You may not be able to purchase just one vial, but the extra cost is worth the savings from potential adverse reactions. 5. Better still, find a holistic vet who’ll know how to vaccinate, or not vaccinate, without harming your dog and already use monovalent vaccines. Is Your Dog’s Vet a Vaccination Expert? And please, bookmark this article and forward it to friends. Just one combo shot can destroy a dog’s health forever. I don’t know when, if ever, this assault will stop. I had two cats vaccinated. They were feral cats from different litters that we chose to have neutered and vaccinated. The male was a pudgy guy that we rescued when he came out from under house in dead winter with snot rolling from his nose on the ground. It turned out he had pneumonia, which the vet treated. Then we vaccinated. He came home like nothing had happened. The female we rescued from a second litter born under the house and rejected by the mother. We bottle fed her, then when she was old enough, had her spayed. When she healed, we took her back for shots. The shots made her so sick I was afraid she wouldn’t make it through the night or the next few days. When we told the vet, he said we didn’t need any more shots for them since they were now inside cats. But this shows how even animals react differently to vaccinations. And the other ferals — we had them spayed and neutered under a special program our county sponsored, every single one of them, and found them all homes. ALL vaccination is over-vaccination. Those first puppy or kitten shots could be their last. If they don’t kill them, they’ve damaged the immune system in some manner, because injecting poisons (and that is all they are) is harmful. After 40 years of observation, 35 years of research, several articles and 2 books published, my mantra is ALL vaccines are ALL poison, ALL the time, in ALL doses. And they have never been PROVEN to prevent diseases. I found, doing rescue, that when all other factors are equal (quality of food, water, environment) the unvaccinated dogs and puppies fare MUCH BETTER and resist disease better than the vaccinated ones. There ARE ways to strengthen immune systems and build health, but injecting cocktails of toxic chemicals mixed with biological waste products is NOT it! Parvo Vaccinations – What The Vet Won’t Tell You! my dog was given cytopoint injection, canine Bordetella, distemper parvo DAPP, Leptospiroisis 4-way and a rabies shot on March 20 and he was dead on March 22. I was not told they were going to give him all of these vaccines on that appointment. We only took him there for the cytopoint injection because it was a miracle in stopping his itching. We are heartbroken and want answers. he was 11 years old and weighed 22.9 pounds and we thought was perfect health. Laureen, your immune-compromised itchy dog was given 8 different injected meds at once. I’m not surprised at the result. The only required vaccine was the rabies, although to give it to any itchy dog is terrible. It surely could have been delayed or not given at all. 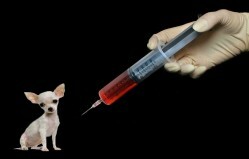 To see if your dog even needed the other vaccines, read http://truth4pets.org/question-before-vaccination/ Why did an 11-yr-old dog need puppy shots? Also, you should have been told about the possible side effects of vaccines and told why they were necessary and asked for your consent. Horrible vet. Please Help, my 6-year-old GSD just had her yearly checkup and vaccinations. 48 hours later she was sick as can be. High fever, excessive drooling, extremely weak and lethargic, not eating and running a fever. She had received the “6 in 1” every year and has never had a problem until this year. How long will she be sick? The vet has put her on a prednisone steroid and fun a full CBC on her blood but as of now, nothing has come back showing any identifiable problems. She has started eating normal again and has shown some slight improvement but she is still getting a fever intermittently throughout the day. Is there anything else I can do for her or is this just a time issue, wait for it to work through her system?? I feel so helpless not being able to help her feel better. John, your poor dog. It’s amazing she’s still alive. No vet organization in the US recommends yearly shots any more and hasn’t for more than a decade. And a six in one is particularly bad. Your vet is horrible. Horrible! Important: Make sure all your dog’s vaccine details and reactions are recorded in your dog’s file in detail. Get a copy. Call the drug maker. Then fire the vet and tell him/her why. Then file a complaint with small claims to get reimbursed for what treatment has/will cost. Never go to the vet again. Never! Tell everyone you know. To help your dog, where do you live? I’ll recommend a competent vet if I can. Otherwise, you’ll need to talk with a vet who will consult by phone. Let me know.